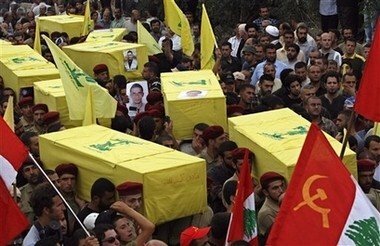 A friend from Israel sent me this recent photo of a Hezbollah funeral march in Lebanon. Note the Lebanese Communist Party flags. Is there a message here? Is Israel and the West fighting not just radical Islam, but a radical Islam allied to a resurgent Marxist-Leninist movement. It's Blair's Law (as in Tim Blair, not me). Eventually all the world's authoritarians are going to form one cohesive, anti-American, anti-Israeli, anti-individual freedom conglomerate. You'll have everyone from Pat Buchanan and Fred Phelps, to Hugo Chavez, to David Duke, to Ahmadinejad and Osama Bin Laden coming together in solidarity. The best we can hope for is that they hold one big convention in Paris and we just nuke the bastards. Hang on, but according to the all the news I read, Israel only killed civilians...surely they can't have killed actual Hezbollah terrorists also? I agree anon. The Marxist/Muslim alliance has been building for years. The war in Iraq and now Lebanon has given it huge impetus. Both camps are pissed off at the West and see that by combining forces they have a chance of taking us out. Of course they'll come to blows in the end, but I don't think we can afford to let them get to that point. A key strategy of Islamic Jihadists is for Muslims to migrate to non-Muslim countries for the purpose of spreading Islam. Their ultimate goal is to destroy the West and bring it forcibly into the Islamic world. They propose to do this by outbreeding us, which is probably a greater threat to a free society than overt terrorism. This helps us understand why Commies like Keith Locke are so outspoken in their support of Muslim radicals like Ahmed Zouai and why Marxist-Leninists all over the world are marching in support of Arab and Islamist causes. As New Zeal readers are well aware, Keith Locke is the son of Communist Party of NZ luminaries (more accurately "low watt bulbs") Jack and Elsie Locke. This "red nappy baby" (now a watermelon Green) remains committed to his Marxist-Leninist faith. Marxist-Leninists believe that the material world is all there is, best summed up by Mao Tse Tung who said: "there is nothing in this world but matter in motion." According to Marxist-Leninists such matter (and the economic and political systems it generates) behaves in identifiable, predictable ways. They believe the world is evolving towards Communism (the highest and best form of social and political organisation) through a process they call "dialectical materialism" (the struggle of opposites). Here, an existing social condition (thesis) comes into dialectical conflict with a new, 'higher' social condition that is attempting to emerge (anti-thesis). Out of this conflict comes 'synthesis' which is then put through the process again as the new thesis, until full Communism is achieved. While Marxist-Leninists believe this will happen anyway, they're not averse to helping the process along a little. In order to multiply their effectiveness, Marxist-Leninists are expert at identifying groups who already have a grievance against the status quo (women, gays, ethnic, religious and political minorities, peaceniks, the environmentally concerned) and mobilising them into dialectical conflict against the existing economic, social and political order. The Marxist-Leninists then form "popular fronts" with these groups by promising to help them get what they want. These front organisations and groups operate to conceal the essentially Communist nature of their organisers' goals and multiplying the organisers' political effectiveness by the number of "useful idiots" that can be co-opted to the cause. Marx once stated: "The meaning of peace is the absence of opposition to socialism" a sentiment that corresponds almost exactly to the Islamic idea that "peace" means the absence of opposition to Islamic rule. Marxist-Leninists support unrestricted immigration, particularly that of Muslims, in order to weaken, dilute and undercut the culture of the West. They hope that ever-increasing numbers of Islamic radicals who won't assimilate will become dialectical change agents in eradicating our Judeo-Christian cultural consensus and traditions of personal liberty. Not much I could argue with in this post anon. Immigration is the sticky point. I'm a believer in a liberal immigration policy, however as "owners" of NZ I think we should have some pretty rigorous policies in place to make it easy to turn away or deport undesirables.